“By rewarding you with this prize, our profession wanted to reward an exmplary educational training”. 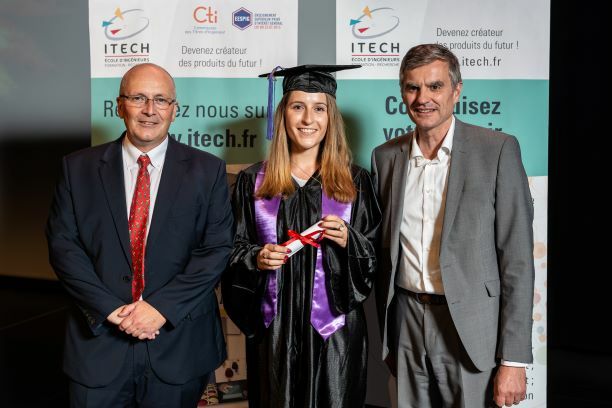 As said by Benoît Dorsemaine, General delegate of Alizé Plasturgie, to Cécile Audran during graduation, the Plastic Manufacturing Federation was highly impressed by this young engineer’s educational path, chosen to be this year’s top student of the Plastic major. Beyond her excellent average year mark (16,75/20), the federation took into account her motivation, her well established thoughts and her capacity to bounce back. Evidently, at the end of 2012, with her baccalaureate obtained, Cécile was a 1000 leagues away from imagining that she would be working in plastic manufacturing. Pharmaceuticals is what interested her, and with this goal in mind, she applied to the Faculty of Medicine. After loosing out by very little after 2 tries, she decided to re-orientate herself towards a Bachelor’s of science in Chemistry at the Université Lyon 1. As the subjects interested her and as she obtained good results, she decided to fully apply herself in the engineering training and, in 2015, the ITECH jury validates her application. It must be said that the school thoroughly examines “atypical” files such as her’s as it strongly wishes to continuously diversify its recruitment. From the get go with her specialisation lessons in “Plastic Materials”, Cecile was enthralled: ” the teachers are real specialists and they know how to communicate their passion to the students”. 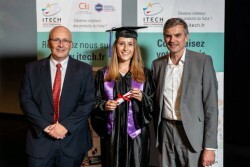 During her 2nd and 3rd year of education at ITECH Lyon, she most noticeably appreciated the research projects ” as they teach how to work in groups”. In the first case, her small group developed polyurethane venous catheters: “this brought us to identify the appropriate polymer and then to make it through extrusion”. In the second case, she developed, with the use of Catia conception and a rheological study, a printing machine hood. Her second year, which included a mandatory internship in a company, turned out to be a revelation for her: ” during my 3 month internship at Astic Injection Industirelle, a small plastic manufacturer of technical pieces, I discovered that industry had nothing to do with the image I had of it”. She feels immediately at ease in this SME in the Drôme county: “as I like everything substantial, I appreciated the teamwork with the machine supervisors of the production workshop, surrounded by an island of 6 injection presses” During this internship, she realised she was destined for solving fieldwork problems: starting and stopping production, adjusting presses and robots, quality testing, etc. Wishing to discover the role of “Project Manager”, she jumped on the opportunity that was presented to her in 2017: doing her final year internship within the “Development and Industrialisation” service of a car equipment provider called Steep Plastique in Saint Maurice de Beynost (Ain). “This 6 month internship allowed me to discover this role through several new piece development projects, but also through existing piece modification ones”. Her work did not go unnoticed as the groupe offered a role as a Project Manager, on a permanent contract, at the end of her final year internship!